But your finger squeezes on the trigger, almost involuntarily, and you feel the pain spread through your whole leg. That’s what self-sabotage can feel like at times… like an uncontrollable urge to screw up your best-laid plans. “Accidentally” because we’re not intentionally trying to screw up or hurt ourselves… but “on purpose” because we’re the ones pointing the gun and shooting it at our foot. And we do it over and over again. Most of us have a favorite way of sabotaging ourselves. We call these doing the “overs”. But what is self-sabotage..? And why do we do it? Any time you do something that prevents you from getting what you want, having something great in your life, or just being the person you want to be… you’re committing an act of self-sabotage. Some types of self-sabotage are big and obvious. We know we should stop doing those behaviors but…. We can’t seem to stop them. For example, chronic worry has been a way Nita has sabotaged herself. Sometimes at night, she’ll find herself lying in bed trying to sleep, but she can’t seem to turn off that annoying voice in her head. At times, she doesn’t even know what has triggered this pattern. Even though she’s worked on this a lot…The sneaky lie that she must control all the details of her life sneaks up on her. Other types of self-sabotage aren’t as obvious… They’re so subtle that it’s easy to miss the signs. You may be so used to doing things one way that you don’t see it as sabotage. For example, we had a client, Marilyn, who had an unconscious need for chaos. She used disorganization and clutter as a way to distract herself from tasks that needed to be done. Her need for chaos was so great that she would even pick fights with her husband when things were going too smoothly! Most people are secretly ashamed that they don’t have more self-control, that they let sabotage get in the way of their success over and over again. This attitude of frustration and negativity is totally understandable… but it’s because most people don’t really understand what causes self-sabotaging behavior. There’s ALWAYS an important reason for our self-sabotage. We wouldn’t do those non-productive things if we didn’t get SOME kind of benefit from it. This is a tricky concept for most people to wrap their minds around… because they’re used to seeing self-sabotage as a purely negative thing. But if you want to change your pattern of self-sabotage, you have to discover what causes your self-sabotaging behavior. You have to figure out the “Emotional Payoff” behind it. Simply put, the Emotional Payoff is the benefit your Emotional Brain gets from doing the behavior. Now, this a very simple way of explaining it, but it helps people understand what causes self-sabotaging behavior. The top part of your mind is the Rational/Thinking Mind. The bottom part is your Emotional/Feeling Mind. These two parts are also called the Conscious and Subconscious mind. 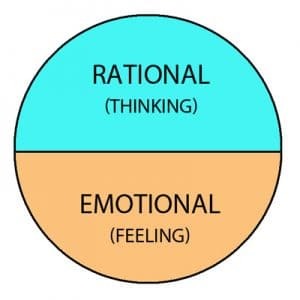 You make many of your plans and decisions in your Rational/Thinking mind, but whether you carry those decisions out depends on your feelings (your Emotional Mind). Imagine your Rational Mind as a tiny rider sitting on top of a huge elephant – your Emotional Mind. For example, your Rational Mind (Rider) is the one who makes the decision to stop stress eating so you can lose some weight. That’s because the Elephant outweighs the Rider by thousands of pounds! So you might be able to follow your eating plan for a little while (your rider is guiding the elephant). But if you get a little tired and cranky… you’re likely to drop the reins. All of a sudden the elephant takes over and crashes through the bushes with you barely hanging on. In other words, your emotions rule and drive your behavior. The simple answer to what causes self-sabotaging behavior is that you can’t always control your elephant. You sabotage yourself when your Thinking Mind (the logical part of you that says you need to lose weight for health reasons) is at odds with your Emotional Mind (the side of you that drinks beer and eats chips when you’re tired and stressed out). The Emotional Brain has its own internal logic. It follows the beat of its own drum. Unfortunately, that’s the complete wrong approach when it comes to stopping self-sabotage! First, you have to discover the Emotional Payoff. Once you do, you’ll realize that your behavior is not as illogical as it seems. Sometimes, the Emotional Brain’s internal logic can create a pattern of self-sabotage that, ironically, leads you to experience the very situation you were trying to avoid. Josh gave a great example of this in our Beginner’s Guide to Overcoming Limiting Beliefs. He was having trouble falling asleep at night, and he noticed it was especially bad whenever he brought on a new client in the business. Josh used some simple techniques to discover the root of his fears: He was terrified of letting his clients down. The reason he was lying awake at night was to prevent that situation from happening. His mind was frantically trying to remember all the things he needed to do in the coming days. Ironically, he knew that if he didn’t sleep well the chances of making a mistake were a lot greater. But knowing that didn’t stop his self-sabotaging pattern of laying awake at night thinking of all the possibilities. We’ve talked about this in other posts, but the number one job of your Emotional Brain is to keep you safe… it’s always trying to prevent bad things from happening to you. Usually, self-sabotage is an attempt at keeping you safe… even if the pattern doesn’t actually help you stay safe! And how complex the inner logic of the Emotional Brain can be! It comes from Dr. Bruce Ecker’s fantastic book Unlocking the Emotional Brain. Ted had a hard time holding jobs and staying on track with his career. He also couldn’t keep a relationship going for more than a few months before he would sabotage it. As a child, his father was hyper-critical and mean towards him. Ted never heard his father say “I love you” or express affection towards him in any way. Ted secretly wanted his father to apologize for this earlier emotional abuse. He wanted him to understand how deeply he had been wounded as a child, how wrong his father had been to be so critical. So it was important for Ted to NOT be successful as an adult. Because if he was successful, his father would think how he treated him was okay… that Ted turned out fine in the end. But it makes perfect sense considering Ted’s upbringing as a child. That need was even more important to his Emotional Brain than being successful in life! Before he discovered this Emotional Payoff for failing, Ted always thought something was wrong with him. He was hard on himself for not sticking with anything. Luckily, there are a couple easy ways to discover the hidden Emotional Payoff behind your self-sabotage. Imagine that you have a magic wand. When you wave it you magically stop doing your self-sabotaging behavior. Imagine yourself successfully doing what you would rather be doing. You’re staying on track and doing so well… day in and day out. Notice how you’ll feel when you’ve changed this pattern. You might feel a sense of pride, you might feel satisfied and like a sense of accomplishment. But you might also feel some resistance come up… In fact, it will probably make you feel uncomfortable to NOT do the self-sabotaging behavior. What bad thing might happen if you stopped doing this self-sabotage? What would you lose out on if you stopped doing this? Josh was having a hard time creating a new sleep habit**. He wanted to go to bed by 10PM every night so he could wake up at 6AM with plenty of energy, ready to jump into his day. No matter what he tried to do, he always found himself sabotaging that goal. Most nights he would stay up until 11 or even close to midnight watching Netflix with his roommate. So he decided to try the magic wand exercise. He imagined himself winding down early and getting in bed by 10PM every night. He imagined himself staying on track night after night – going to bed early and waking up early. He also realized that he was rebelling against the conventional wisdom that successful people have to go to bed early and start their days early. The whole “The early bird gets the worm” mentality. Every time he stayed up later than he wanted to, it was because he wanted to be an “exciting, fun” person… not a boring person who goes to sleep early. It was also an inner act of rebellion against the conventional wisdom about success. He secretly wanted to prove that he could stay up late and still be successful. Of course, the irony is that when he stayed up late, he always woke up the next day feeling groggy and tired… so much for having a successful day! You’re asking yourself why it’s important to keep doing the self-sabotage, instead of trying to figure out how to stop it. If the answer isn’t coming to you easily, turn the question into a simple sentence completion exercise. Just fill in the blanks with whatever pops into your head. Sometimes you have to finish the sentence a few times before you discover the true Emotional Payoff. Nita’s pattern with overeating started early in her family. She grew up with a father who cycled between depression and rage. During his rages he was emotionally intrusive, asking pointed questions about her behavior. And criticizing her answers loudly. Food became her comfort as a child. She learned to “eat” her feelings and numb herself with food. Her father’s anger couldn’t engulf her if she was large. Her fat prevented him from invading her emotional space. You probably think this doesn’t make sense. But being fat equaled safety in her Emotional Brain. That’s the reason Nita has struggled with her weight most of her life. Nita’s experience is a common one for women who have been emotionally or sexually abused. In fact, any kind of abuse can be a setup for eating disorders. For some people, procrastination is a way of life. Maybe you always run late getting places. Or you don’t start a task until the very last minute. And you may be clueless about why you procrastinate. Dr. Bruce Ecker told a great story about one of his clients. He came to Dr. Ecker desperate for help with his pattern of chronic procrastination. He was in law school and just couldn’t bring himself to do his assignments on time. After talking with his client for a while, Dr. Ecker helped him uncover the reason behind this self-sabotaging pattern. “I secretly hate law school and I don’t want to be here. I’m only doing this because my dad wants me to and he’s convinced me I should do it. Once he realized his important reason for procrastinating, he decided that his heart wasn’t in law school… and he left. We already covered this up above, but there’s a powerful Emotional Payoff for people who suffer from chronic worry and anxiety. If you worry all the time, you can think through every possible scenario and deal with it in your mind before it happens. The payoff is that worrying makes you feel safer (ironically) because your worry prepares you for all the bad things that could happen. If you were to magically stop worrying, your Emotional Brain would probably even feel even more unsafe… because then you wouldn’t be prepared for the worst! Want Some Tools to Stop Worrying? We all know someone who is chronically late to meetings. Maybe you are that person..? But then they somehow manage to show up 10 or more minutes late, despite their best intentions. As you can see, behind any type of self-sabotage is an important Emotional Payoff. The most damaging patterns of self-sabotage are the ones that screw up our relationships at work and at home. Remember how we said that most types of self-sabotage are subtle, but insidious patterns..? Most people aren’t aware of old survival programs learned at a young age..because they’re hidden and unconscious. Luckily there is a free assessment to help you! Dr. Shirzad Chamine, a Harvard psychologist, had developed a free Saboteur Assessment to identify your unique ways of self-sabotage. According to Dr. Chamine, everyone has saboteurs. The trick is to discover and name which ones you have and how much they impact your life. We formed our saboteurs when we were young, from interactions with all the people around us. Remember that the main job of your Emotional Brain is to keep you safe. And it does that by forming these special guardians (Saboteurs) to protect you from real or imaginary threats. The issue is that, by the time you’re an adult, you no longer need these Saboteurs to stay safe. But they have already taken over your mind. But you don’t even know you’re wearing them! For example, one of the Saboteurs is the Stickler. Someone who has a strong Stickler is quick to point out everything that is wrong with a person or a situation. We all know someone who is hyper-critical and always looking for fault. If I kept him happy and everybody in my family happy, then I wouldn’t be a target for his rage. We use this assessment with all of our coaching clients to help them understand their own unique patterns of self-sabotage. You may find it helpful. Check it out here to discover your unique saboteurs. Once you get the results, pay attention in particular to the section on “Justification Lies” for each of your Saboteurs. The justification lies are the Emotional Payoff that we’ve been discussing. So the very first, and most important, step for changing a pattern of self-sabotage is to discover the Emotional Payoff behind it. Once you do, you’ll know the important role this sabotaging behavior has in keeping you safe from harm… or in giving you some other kind of benefit. We gave you a couple simple tools above to help you figure it out. In the coming weeks, we’ll be sharing more tools & resources to help you change your patterns of self-sabotage. Leave us a comment below telling us one pattern of self-sabotage you have… and the Emotional Payoff behind it. –> My pattern of self-sabotage is to spend too much time during my breaks from work reading about sports and other things… instead of getting up and moving.